I grew up in East Sussex , I have been a teacher for 27 years, a Headteacher in the North for 12 years and, at the age of 51, this much I know about the North/South divide. It’s about the quality of teaching, stupid! I know of one Local Authority, the majority of whose students are in one of the worst performing ethnic groups (90%+ White British) who received a letter from OFSTED congratulating it on its schools’ 2015 KS4 outcomes and whose five 11-18 schools were all classed on the A Level Performance System (ALPS) as Excellent for progress at both AS and A level in 2015. 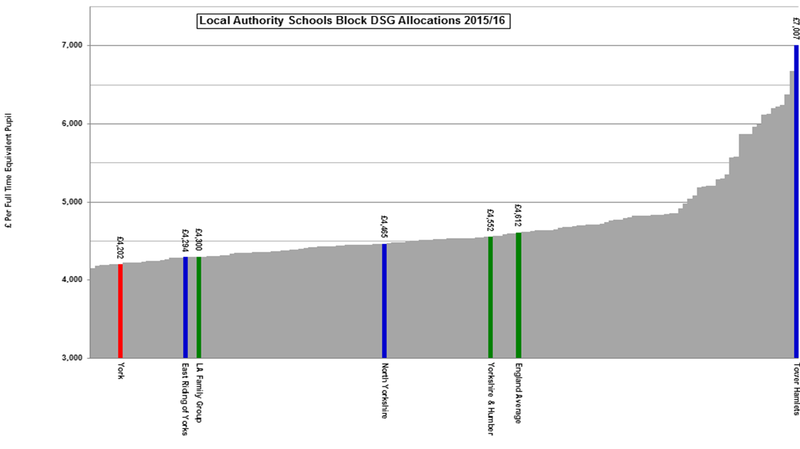 That Local Authority is in the North, has 20%+ of its children living in relative poverty, is the seventh worst funded Local Authority in the country in terms of Direct Schools Grant, and only 20% of its secondary schools have academised. The two academies work harmoniously well with the other schools and relationships are not mired by a sense of corrosive competition. That LA is often asked, You are in Yorkshire and Humberside, the worst performing region in the country, and yet your secondary schools do so well – what’s your secret? Answer: The Local Authority’s secondary school leaders’ energies are focused almost entirely upon improving the quality of teaching. That Local Authority is York. Background matters. Professor David C. Berliner’s paper Exogenous Variables and Value-Added Assessments: A Fatal Flaw asked some good questions about the cornucopia of variables which affect our students’ performance. It seems that cultural background matters a great deal. And don’t go comparing the northern schools with schools in poorer areas of London; it’s a completely flawed comparison, as Professor Simon Burgess explains in his post Education and the London Effect. Nudge politics. Newspaper paper headlines like the one below do the government’s job for them. 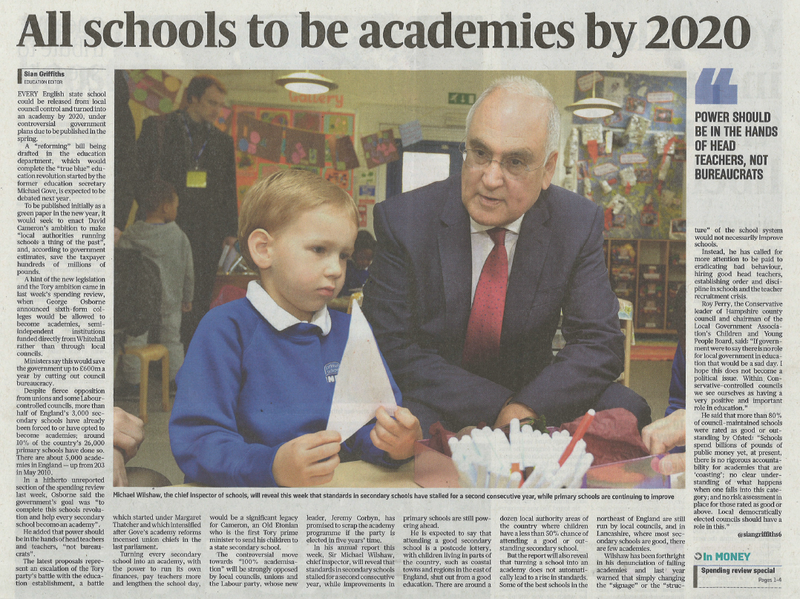 If the government says often enough that all schools will be academies, the schools will academise without the government having to legislate. It’s clever stuff. If you bother to read to the end of the article, however, you’ll see Sir Michael makes the point that school type doesn’t matter. Structural solutions are a distraction. No concrete evidence exists that academisation makes any difference at all. Fabulous stuff John. 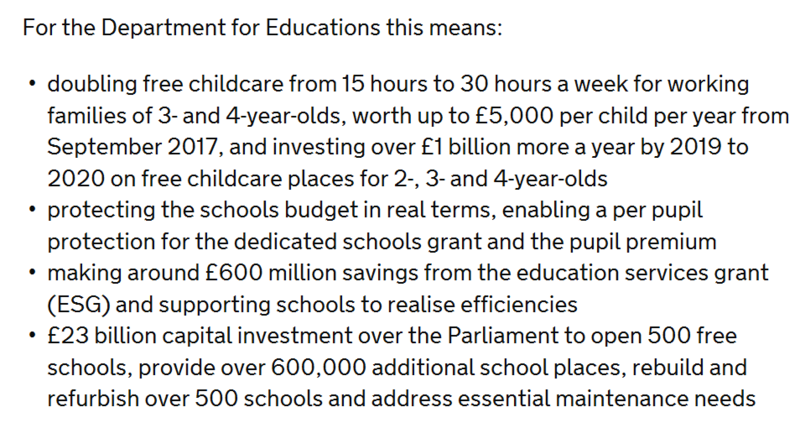 That DfE blurb is the ultimate manure sandwich… a double topping Scooby Snack even. Realise efficiencies! In other news, choco rations are up again for the 3rd week running… Woohoo! Well said, sir! I think “It’s grim up north” needschanging to “It’s good up north”. But Eton is a long way south and in a very different world! Thank you for sharing these insights – there are amazing schools, teachers and students in all of these Local Authorities and we have had the privilege to work with many of them. In terms of sharing best practice I believe we all have a responsibility to reach out and help. We see schools of all sizes across England (& wider afield) making a real difference by moving to a Cloud led approach to Learning placing the focus on collaboration and communication between staff & students delivering timely feedback throughout the student’s learning leading to engaged, motivated and successful students. Gosh, it’s refreshing to read a comparison between North and South that mentions funding discrepancies and doesn’t gloss over them to pin the sole reason for the difference on leadership.